Located in the north-east of Tamriel, much of the landscape is as twisted and mountainous as its neighbor Skyrim, but it is a hot, desolate land, even far from Vvardenfell and its famous volcano, Red Mountain. Previously named Resdayn, Veloth, Dwemereth, and Dunmereth, it was home to the mysterious, lost Elven tribe called the Dwemer, and their cousins, the Chimer of Summerset who became the Dark Elves of today. For the last two Eras, it has been called Morrowind. The earliest civilization of which there are records is that of the Dwemer. Sometimes called "Dwarves" by the ignorant, the Dwemer were the remnants of the early Aldmer who had settled the coasts, and developed a highly sophisticated and technological culture. The rule of the Dwemer in Morrowind was contested by another group of Mer, the Chimer. The Chimer were, like the Dwemer, descendents of the Aldmer, and had followed their prophet Veloth across Tamriel from the west. Soon, they abandoned nomadic life and divided themselves into what were known as the Great Houses, tight-knit political clans that survive in Morrowind to this day. Disputes over territory marked the early interactions between the two groups of Mer. These battles were fueled by the conflicting religious beliefs of the two cultures. While the Dwemer were an agnostic people, preferring reason to faith, the Chimer were staunch Daedra-worshippers, and considered the Dwemer's lack of belief an affront to their gods. It was not until Nordic invasions of the First Era that the two groups of Mer were able to achieve peace. An alliance led by Nerevar of the Chimer and Dumac of the Dwemer was successful in routing the Nords from the land, and creating the First Council. Ultimately, though, the cultural differences between the two groups were too great to allow for a lasting peace. The War of the First Council culminated at the Dwemer fortress of Red Mountain, although accounts of the final hours of the war varied. It is known that Nerevar was slain during or shortly after the battle, although by whom remains a point of much contention. Dumac and all of his Dwemeri brethren were killed, but the exact manner of their extinction is still debated. Nor did the Chimer leave the battle of Red Mountain unchanged: their skins were turned to grey and their eyes fire-red. They would henceforth be known as the Dunmer of Morrowind. Perhaps the most important consequences of the battle were the changes effected in Nerevar's closest advisers. His trusted Tribunal - Almalexia, Sotha Sil, and Vivec - were found to have attained great, even god-like, power. His general, Dagoth Ur, originally thought killed at Red Mountain, was later found to have attained similar degree of power. These four former mortal individuals were to become seen as symbols, champions, gods, and villains, sometimes revered and sometimes despised. The four, until recent years, exercised great influence over the development of the nation of Morrowind. While most of the local governance of the province continued through the Great Houses, the Tribunal ruled the land indirectly through their Temple, and inspired the Dunmer with their status as Living Gods. The Daedra worship that the Chimer espoused was considered nothing more than a prelude to the new spiritual awakening of the land. Their powers were tested as they joined with the Reman Dynasty to defend the land from the Akaviri. Though victorious, Morrowind's relationship with the Cyrodilic Empire did not remain cordial, and after steadily growing mistrust, The Four Score War erupted in the 2840th year of the First Era. The Tribunal, and Vivec in particular, demonstrated enormous power and leadership in battle after battle, yet neither side advanced for almost eighty years. In the end, it was the diplomatic skills of the Three that ended the war. Whatever the extent of the Tribunal's power, and how much fancy has been woven into their legend, there can be no doubt of their diplomatic prowess. While other provinces flailed in the chaos of the Second Era, the Tribunal kept the disparate Houses of Morrowind in check, and repelled yet another invasion from Akavir. The Tribunal's diplomatic skills were put to the test yet again at the end of the Second Era, when they were faced with the external threat of Tiber Septim's rising Empire, as well as the internal threat posed when Dagoth Ur, after long slumbering, arose to take back his fortress of Red Mountain. Septim, not eager to fight three Living Gods and also worried about Dagoth Ur's return, agreed to a treaty, as described in the history section of this book. 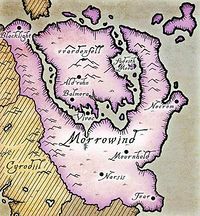 The treaty gave Morrowind autonomy and gave the Septim Empire the means to conquer the rest of Tamriel: an equitable solution for both parties involved. A further concession was given to Septim's demand for a central authority in Morrowind: a ruler who could be his hand in the domain. Barenziah, daughter of the ruling family of Mournhold, was the first to be given the title of Queen of Morrowind. The title was largely ceremonial, but the young Queen and her consort, Tiber Septim's general Symmachus, proved to be extremely popular with the Dunmer people. The Arnesian War was one of the many during the troubled time of the Imperial Simulacrum of Jagar Tharn. What started as a simple slave revolt in the House Dres lands of the south built on itself until the swampy plains erupted with blood and fire, pitting Morrowind against Black Marsh. During the chaos, Symmachus was slain, and Barenziah, rightly fearing for her life, fled across the Empire to the High Rock kingdom of Wayrest. The Queen abdicated her throne, leaving it to her uncle Athyn Llethan, a House Hlaalu noble. The uneasy truce between Temple, King, and House was beginning to crumble. Dagoth Ur was ascending, the Tribunal was collapsing, and then, according to current popular rumor, a miracle occurred. Indoril Nerevar was reborn, and returned to Morrowind to set things to right. Whether the mysterious figure who arrived in Morrowind was truly Nerevar reborn cannot be known, but the repercussions of that arrival on the shores of Vvardenfell may not yet be fully realized. Dagoth Ur and two members of the Tribunal, Almalexia and Sotha Sil, were destroyed in the Nerevarine's fury. Vivec too may have been killed, but his fate is currently undetermined. The Nerevarine likewise has vanished. During this time, another legendary figure, Queen Barenziah, also returned to Morrowind. The sudden death of King Llethan, and the subsequent coronation of Barenziah's son Helseth, was the source of much discussion, but as one Nord diplomat famously put it, "The new king is manipulative, ruthless, and calculating. He is exactly what Morrowind needs." The young king has been somewhat of an enigma, both to outside observers and to his own subjects. One of Helseth's first edicts as King seemed particularly designed to dismantle the traditional power structures of the Dunmer. In accordance with the longstanding wishes of the Empire, he outlawed slavery throughout Morrowind. The reaction to this was bloody, as could be predicted, though the alliances formed were far from expected. As Helseth himself put it in a speech to his people, "If there is to be a revolution, it is best done by a King." Actions such as this have led many to label King Helseth as the latest in the lineage of Imperial figureheads, though some of his other actions would cast doubt on this pronouncement. Helseth's reformation of the Grand Council, which includes the heads of all the Great Houses, was seen by some as a return to more traditional Dunmer ways. The Great Houses themselves, long stagnant, are adjusting to the new powers in the land. Some, like Dres and Hlaalu, appear to be on the rise, embracing the new traditions while welcoming the return of the old. Others, like Indoril and Redoran, seem to be waning, unable to change with the times.